Are you pregnant and wanting to eat everything you see? That basically sums up the way I felt in my first and second trimesters of this pregnancy. In general, ice cream is my go to basically for breakfast, lunch and dinner. Being that I can't eat ice cream all day everyday (although I really want to), I started making creamy, luscious smoothies with fruit to fulfill some of the cravings while adding a ton of nutritious foods that I know I should be eating for the babies brain and development. I started by going to the health food store and per the manager's recommendations for a pregnant woman started trying a ton of chocolate protein powders. In my first 8-17 weeks I was having horrible headaches and my midwife told me I needed to eat protein every 2 hours, yes, every 2 hours, in order to help the headaches subside. 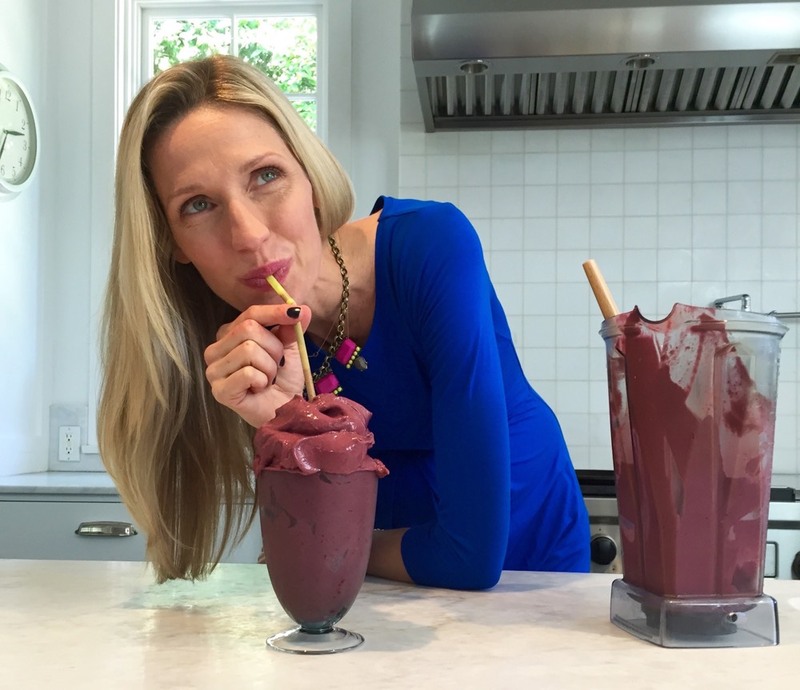 You can easily make this smoothie with any brand or flavor of protein powder you enjoy, but Plant Fusion and Aloha Brands are two of my favorites as they're vegan and full of essential nutrients. The best part is this only takes me minutes to make. I buy huge bundles of ripe bananas to freeze, add a bag of frozen raspberries, 1/2 a bag of frozen black berries, a vitamin rich greens powder(you could also use fresh kale or spinach), hemp seeds on occasion, bee pollen (a great immunity booster), a pinch of Himalayan sea salt which is supposed to help with the absorption of minerals in the smoothie,a good club of milk (you can use any kind or brand you enjoy) and a big scoop of the protein powder to make it extra creamy.. I whiz it up in my Vitamix using the plunger to get everything pulsed up and when I don't have time to enjoy it immediately I will put it in the freezer later so it takes like my beloved ice cream. Whether you're pregnant or not, this is a treat you will want to have every day! 2. Place in a tall glass and drink immediately or freeze for several hours to achieve the consistency of ice cream. Aww!! I didn't know you were pregnant!! Congratulations!!! You look ADORABLE!! 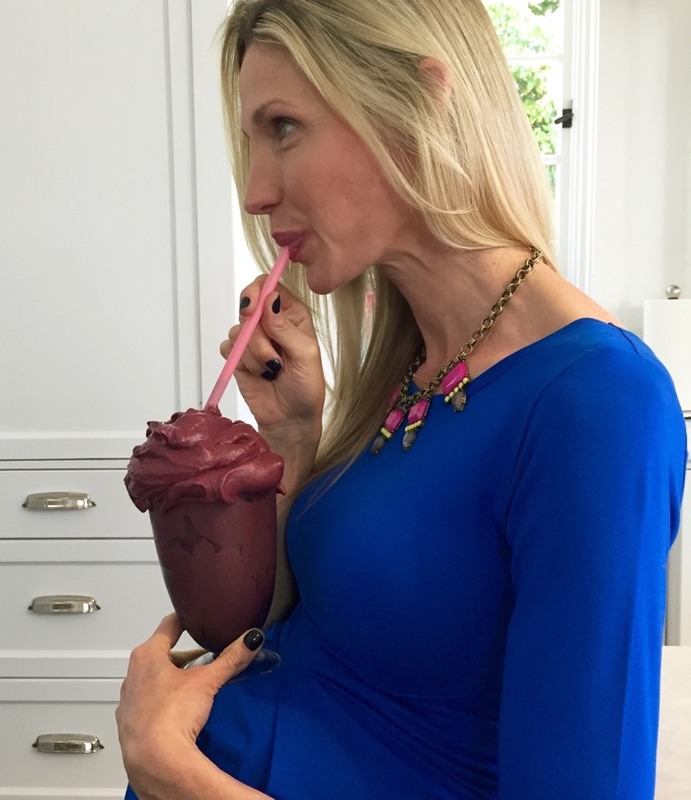 And your pregnancy smoothie ice cream concoction looks divine!! Can't wait to try it! :) (not pregnant over here...but hopefully within a few months!). Congratulations on your pregnancy! What a beautiful and talented family! Thank you for the smoothie recipe, looks delish. This seems delicious! I am also pregnant and not a huge vegetable lover, unfortunately. I was looking to incorporate smoothies into my daily routine and this is definitely something I would be into trying. What kind of vitamin rich green powder do you use and how much? Or how much spinach/kale? I know you mention it in the write-up, but not in the ingredient section. I will sometimes add a large handful (or about 1 packed cup) of fresh baby spinach or baby kale! Congrats!!! Thanks for sharing the adorable belly shots! I love plantfusion protein powder too! But it has stevia in it, is that something you drank during your pregnancy? 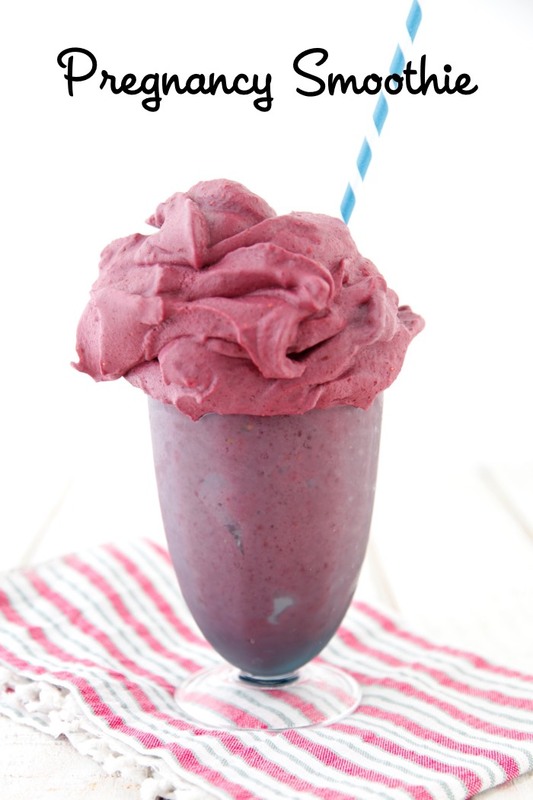 I know this is an old post, but I love you recipes and smoothies! I am currently pregnant, and was wondering what protein powder you used during your pregnancy? I know some protein powders have a lot of junk in them, so which one do you recommend? Thank you!